Tamar Adina on “Tichel Intimidation”! I have a love/hate relationship with the weekly ‘challenges’ Wrapunzel runs. I absolutely LOVE looking at the amazing tichel photos, and I look forward to hearing what the new challenge of the week is going to be! But at the same time, I rarely participate. I’m not a newbie tichel wearer, but I’m not as put together as the other posters! I have a hard time creating pleats and I never get lace to look nice on me without having it “hurt” later in the day. I’m never sure if I’m wrapping my tichel right, I just kind of “put-it-on”. I have lots of scarves in my collection, but I don’t really have the time to play with new wraps, and sometimes I just throw on a hat to do my grocery shopping. I feel like everyone else goes to Target while wearing an amazing tichel. I dunno, seeing the photos makes me feel dowdy. Any advice? So, first of all, repeat after me: I am not dowdy. I don’t care if you are wearing a pair of oversized sweats with pink fuzzy socks while reading this — you still are not dowdy. 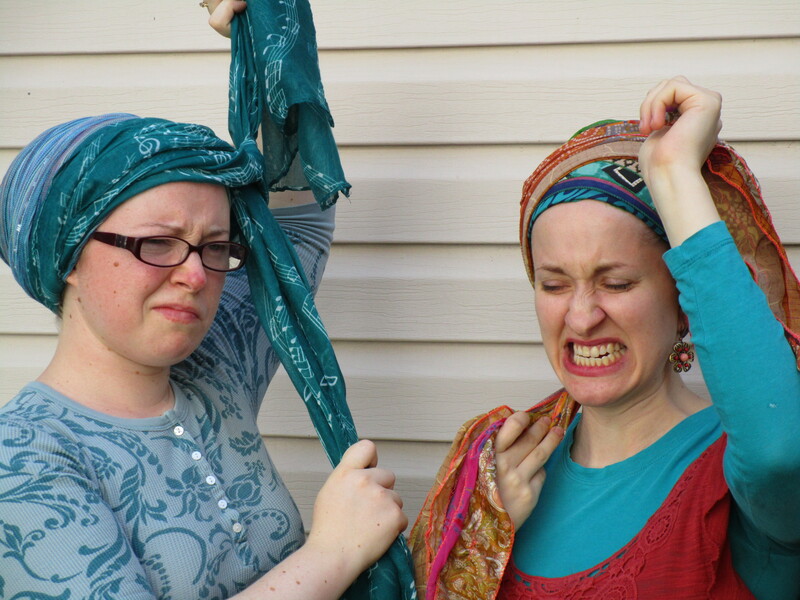 It sounds like you are feeling a little overwhelmed and even a bit insecure about your tichel wrapping ability. The goal of the “wrapunzeledin” challenges was never to make anyone feel intimidated, but I can feel your frustration. Andrea’s product photo outtake. Yikes! I’d like to share with you something that one of my favorite professors used to say constantly. She told us to remember that when we entered a patient’s room, even if we had worked with the patient 2 million times, we were still walking in “IN THE MIDDLE.” What does this mean? When walking into a patient’s room, we were seeing a snapshot of the person. We were seeing one moment from that person’s life. If we were to run into him at another time while in Starbucks, we would like see a totally different snapshot. But in the hospital, the patient is in the middle of some type of crisis. Even if in theory we know “everything going on” in the crisis (especially since we have a medical chart), the truth of the matter is that we are only able to see part of the story. We really don’t know what happened five minutes before. Did the patient just find out that he has to stay another night? Even though we might have known about that possibility, maybe the patient didn’t. Maybe in addition to the crisis lens, we also need to apply the “missing my pet cat” lens. Did the patient’s best friend just come by for a visit and she brought smoothies with her? That can change the lens as well. Naomi Rose wearing *gasp* a pre-tied! Why am I blathering on about being “IN THE MIDDLE”? Well, because that’s exactly what an Internet selfie is! You are logging into the conversation and entering “IN THE MIDDLE.” The beauty of the Wrapunzel Fangroup is that it connects many Wrapunzelistas and gives us a sense of community. Many of us don’t live close enough to each other to socialize in person, and the Fangroup offers that opportunity. At the same time, the picture that someone posts captures only one moment from a person’s day. The photos in the Fangroup are just that – photos. They don’t tell the whole story. They tell only the information that the poster feels comfortable sharing! And while there is that rare breed that manages to look good all of the time, the truth is that the rest of us are usually “winging it” as we go. That gorgeous tichel someone posted might have taken three attempts to accomplish. Even if the poster wrote: “I had some frustration this morning,” since a picture is worth a thousand words, your brain will register the picture over the comment. Looks like Rachel needs a nap! Someone else might have cropped out their tummy/chest in order to hide the fact that they’ve recently gained or lost weight. Another person might have artfully used a necklace to quickly cover a ketchup stain that an adorable toddler blessed mommy with during lunch. Another wrapstar might be posting a photo during her thirty-minute lunch break – the first time all day that she had a second to tie a tichel or apply makeup. Had you seen her two hours prior while she was on the phone dealing with “that client” (you know, the one that makes you question your career choice), she would have looked slightly less polished. Or or or or or….the list is endless. Also keep in mind that people tend to use their nicer photos as their profile pictures. So while you always see “Tamar Adina Campbell” commenting on Facebook from behind a profile picture that looks phenomenal, the real me might be typing while sitting on the couch and wearing a raggedy old college sweatshirt (yep, guilty as charged). So while it might look like everyone else is “constantly put together,” very likely that is not quite the case. Some women will wear tichels for a week, and then take a break from elaborate ties while dealing with a sick spouse, or while on a business trip. With the number of women on the Fangroup nearing the thousands, you might not realize that a particular poster only puts a selfie up every few days. 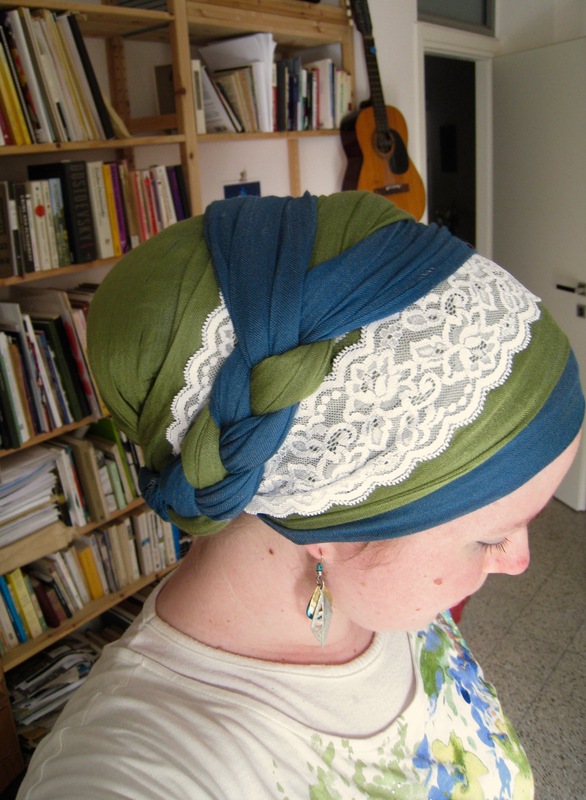 But – (because I know there is a but), what about those women that post a tichel of the day everyday?! Or those women that I know in real life that always seem to look good? Well, the truth again might be that you are again only joining “IN THE MIDDLE”. You see the one selfie that looks amazing, you don’t see the 5 others that were deleted. You see the one tie that looks great, you don’t see that moment where she ran around trying to figure out where her shaper disappeared to. Lastly, remember that we are our own worst critics. Nobody else will judge us nearly as harshly as we judge ourselves. So while you look in the mirror and see a messy back of the tichel, or a pleat that isn’t perfect, nobody else is giving you condemnation. In fact, it’s more likely that you will inspire someone to share their own wrap! So keep your chin up, and be proud of what you can do – we are all doing our best, and that means different things at different times. Wow! Wow! Wow! Ladies, we were blown away by the seriously amazing Challenge of The Week submissions we received for #wrapunzeluplifted! Switching to a theme that wasn’t so black and white was one that we suspected might be difficult for some, but you all responded to it beautifully and we are thrilled to be able to share so many amazing photos, along with deeply personal messages from women far and wide! To join in next week, check out the directions at the bottom of this post. Thank you everyone for your wonderful submissions! Bonus: This week’s collages contains one woman wearing festive lights. Plus, two submissions from a very young wrapper! Can you find them? I had been interested in covering and covered part time since 2011. After my second child was born I have had a terrible time managing depression and anxiety. In June 2015 I took the plunge to cover full time. Amazingly it has helped tremendously. Not only have I been able to manage better, I have been starting to feel like my old self for the first time in a long time. Wrapping has helped me toward the path of finding myself again. #wrapunzeluplifted – Catherine L.
#wrapunzeleduplifted My wrapping journey has been a lonely one. I cover in an area where for years I was the only lady who did so. I also had no support from extended family in my decision. It was heart-wrenching, difficult, and fearful at times. However, finding this group helped diminish the fear, and helped me to see myself as I truly am and to hold true to my personal convictions. And even though the same circumstances are there – (a community that does not cover and a non-supportive extended family) I am able to now see myself as a light in the world I live in. I wear my crown as a Queen and feel honored to cover. I wouldn’t be where I am in my covering journey if it wasn’t for this group! So, I am uplifted every time I come here. – Emily B. #wrapunzeluplifted I’ve been struggling with depression my whole life. Its especially bad arounf the holidays, and worsened by the fact that tomorrow is 1 year ago that my best friend of 16 years passed away. However. When i wrapped Monday night, i was able to smile…to genuinely smile. I felt vibrant and happy, and comforted. Definitely an uplifting experience. – Yasmin D.
Had a rough exhausting day Friday and then needed to vend at a holiday event. 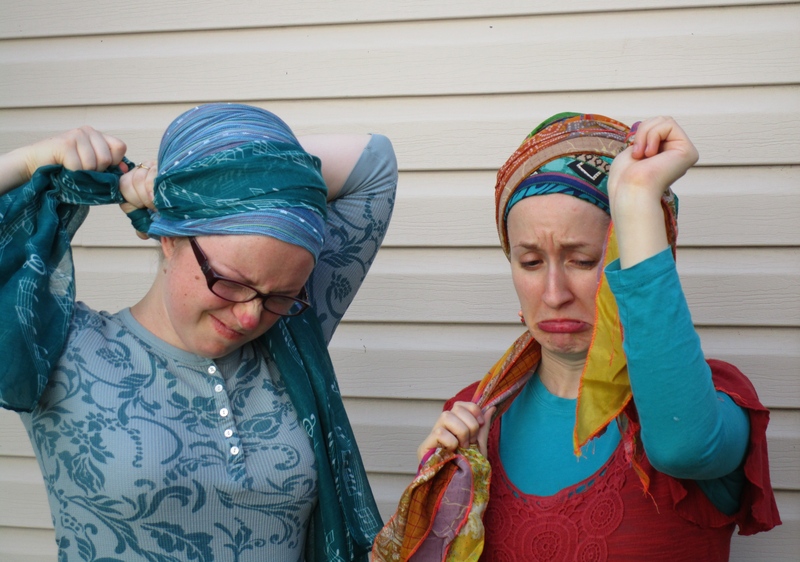 As I finished my wrap #onescarfchallenge, after a tieing tantrum, and saw the results… #wrapunzeluplifted! My mood lifted, I made the booth fee and made enough to buy the matching bracelet. Before wrapunzel (the tutorials and the amazing community) I would have felt tired and ugly and grumpy and probably would have had a correspondingly poor evening. Thank you all for helping me accept that I matter, that I am beautiful, and that being an island doesn’t have to be lonely! – Sheryl G.
#wrapunzeluplifted because I have grave’s disease and my one eye sticks out farther than the other and my hair is thinning a little bit and I’ve struggled with feeling beautiful…bright colors like my pink pashmina and gold shimmery make me feel pretty and feminine again. wrapping makes me feel uplifted! – Ireri C.
Would you like to be featured in next week’s collage? Head on over to the Wrapunzel Fangroup and share your pictures using the hashtag #wrapunzeledinlace . If you would also like them featured on next week’s blog post, make sure to also post them in the comments on the pinned post at the top of the Fangroup page, so we know to share them. We can accept up to 5 headshot-style photos per person – no collages, please! If you’re not on Facebook, you can also email us your pictures with the subject line “Challenge of the Week.” Can’t wait to see what you create!! Look at this awesome article written in the Jewish Chronicle in the UK! Our very own Wrapunzel lady, Judy Silkoff, wrote it! Yay… love it! Ever despaired of deciding which tichels to throw into your suitcase? I’m in beautiful Israel right now, and I think I’ve finally perfected my packing strategy. Here are my favorite tips for your next trip! 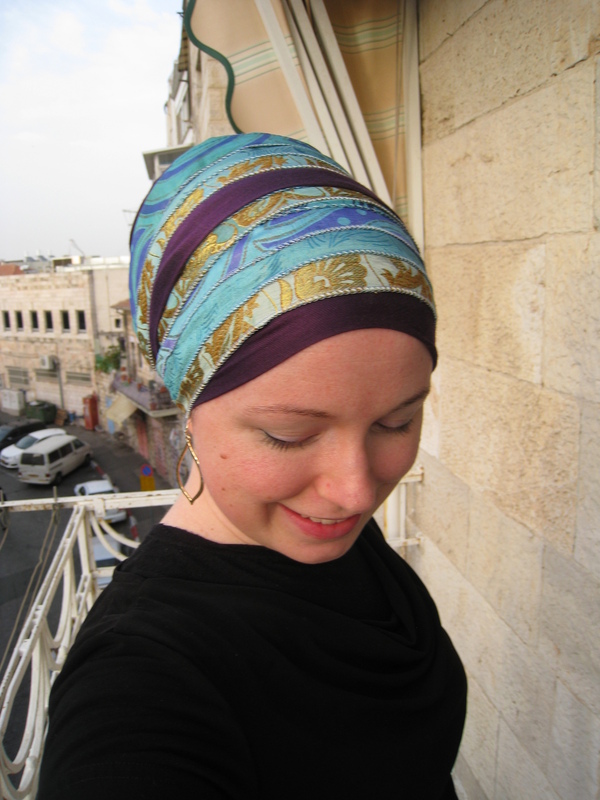 Here’s a recent travel-selfie: a wrap using a sari sash and a purple 2-in-1 from yesterday in Jerusalem! 1. Don’t forget your “undergarments.” This one’s first, because you’ll want to check and DOUBLE check that you didn’t forget your no-slip velvet headband or tichel shaper! Even if you forgot to pack ANY scarves, you can buy one almost anywhere – but your essential tichel underwear is hard to replace! 2. Lay out the clothes you’re bringing as you choose tichels. It’s easier to see what’s going to work if everything you’re bringing is in front of you. 3. Use a formula (loosely): Two parts basic solid colors, one part fancy/patterned tichels, two parts accessories. 2:1:2. It’s a ratio. The first category is solid colors that match your wardrobe. The second is either special-occasion tichels (whatever that means for you – one woman’s basics are another’s night-out scarves! ), or scarves with a pattern. And the third is any kind of accessory – pins, sashes, headbands, you name it. So how do you use it? Let’s say you’re going for a long weekend, and you want a decent (but not huge) amount of scarves – you’d probably want to double the ratio, so you’d pack 4 solids, 2 fancy or patterned scarves, and 4 accessories. This is just a guideline – don’t get too rigid about it! I don’t adhere to it 100% but these are the general proportions whenever I pack. The ratio approach saves me from silly decisions like packing 20 of my “faaaaavorite” sari scarves/patterned scarves and getting stuck because I forgot the basic colors. How many times should you multiply the ratio? Probably x2 for a long weekend, x3 for a week, and x4 for long trip. I’m in Israel now for two months, and my ratio is about x3.5. This balcony is just great for tichel pictures! 5. Remember the weather!!! Leave your pashminas at home when traveling to hot climates, and pack extra-warm scarves for snowy situations. And one from today. I got so many compliments on this! It’s a Liezl with two 2-in-1s and a lace sash. 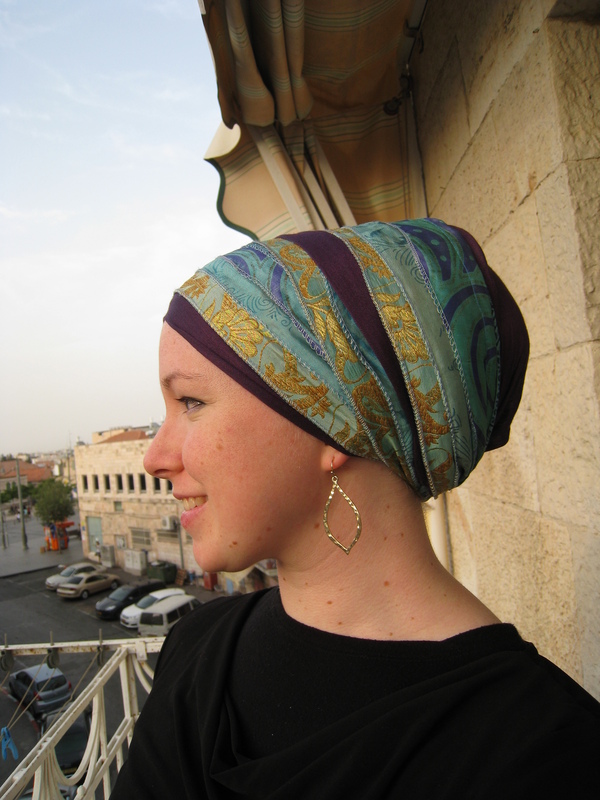 What are YOUR favorite traveling tichel tips??? Share them below in the comments – we’d love to hear!